I could give this book the shortest review in history by simply saying: don't walk, but run to get your hands on it and READ IT, but the brilliant Colleen Hoover deserves a little more praise for this story than that, so I'll elaborate.. It Ends With Us is a book that I couldn't put down. I stayed up half the night just to finish it! The characters grabbed me straight away. Not within a few pages, but within a few paragraphs. There's Lily Bloom, a young woman who is working hard at making the best life she can for herself. She moved from her home-town in Maine to Boston, and she dreams of one day owning a florist shop. One night, she meets a young man named Ryle, when she is out on an apartment rooftop (both are there to get some fresh air and clear their heads after the rough day they've each had). They talk for a while, and get to know each other before Ryle is called away for work (he is a neurosurgeon at a local hospital). They each go their separate ways, but their encounter leaves a lasting impression on them both. So, Ryle and Lily begin a relationship which starts off slow, but soon becomes more serious.. I really don't want to say much more about the storyline because I would love for you to discover this book for yourself. I wish I could write just what makes this book so amazing, but I would spoil it for others and that is not what I want to achieve. What I do want is to give books like this one the commendation it deserves, and to hopefully sway you into reading it. Even if you don't have much time - for this, you really should make the time! It is highly emotional, and very, very beautiful. It is so much more than just a love story.. I know that there are those of you who prefer to read light-hearted novels, but this is one you will enjoy, even if it leaves you emotional. For those wondering, yes, I cried, but I hope that doesn't deter you from reading it. Women (I'd suggest from about 17+), and even men, should read this book. It makes you think about things in a different perspective, and it is a story that you will think about again and again. The Note From The Author right at the end of the book added the cherry on the top (but read it after you have read the book because there are some spoilers in there). This book deserves all of the stars. I would love to see it adapted to a movie too.. If you read it, I would really love to hear your thoughts on it. 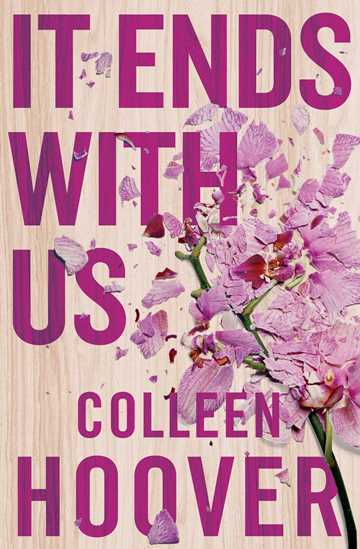 It ends With Us was released last week, published by Simon & Schuster. It certainly sounds like this book made a huge impression on you. You've done well to share how amazing it is, without spoiling how it unfolds for others, which would be quite a tricky thing to do! Sounds good. I'd really love to read it. I'm always looking for new books to read. Doesn't matter that I've already got heaps of them. Details! Great review. 'It ends with us' sounds like a very interesting read! I can clearly tell that you thoroughly enjoyed this book! I like your review but I don't think I can read anything sad anymore...even romances.